Acid based pine fresh smell. Description: Removes scale and stains from toilets and urinals easily. Kills odours and bacteria and leaves toilet clean and fresh. Can also remove rust from metalwork prior to repainting. Use for toilets and urinals and also for cleaning and descaling of concrete or quarry tiles in shower areas and food processing plants. Directions: Use diectional nozzle to apply on affected areas leave for at least 10 minutes and agitate if necessary. Flush and rinse away. For descaling dilute 1 part to 10 parts water apply with mop and leave for 10 minutes. Rinse and allow to dry. Nb Do not use on acid sensitive surfaces. If used regularly on concrete will cause deterioration and metal should be painted immediately to prevent rerusting. Available in 1 litre directional flip top or 5 litre plastic containers. Description: Quickly and simply clears blocked drains and sinks. Dissolves obstructions with ease. Displaces standing water and penetrates and seeks out the blockage. Description: This is a formaldehyde free product based on quaternary ammonium compounds perfume and dye in aqueous solution. Chemical toilet additive is very effective at masking the odour of faecal fatty acids, whilst maintaining excellent bactericidal activity at long dilutions. Directions: Use 1 part product to 100 parts water for monthly emptying, 1 part product to 200 parts water for weekly emptying. 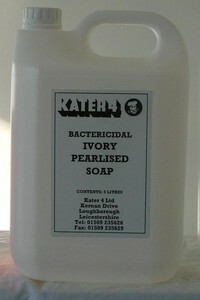 Product is available in 5, 25 and 200 litre plastic containers. Description: This product is intended for use in domestic and industrial washing machines. It is a blue liquid with a faint characteristic odour and washing results compare favourably with proprietry branded liquids. This product contains anionic and nonionic surfactants, phosphat, sodium silicate, foam control agents, optical brighteners, fragrance, enzyme, preservative and dye. 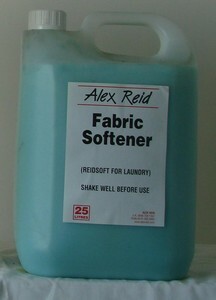 Directions: For normal soiling and soft water add 120 mls to the wash for hard water add 150 ml. For heavily soiled clothes and soft water add 150 mls to the wash and in hard water areas add 180mls. 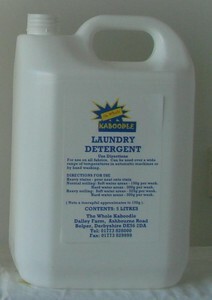 Product is available in 5 and 25 litre plastic containers. Description: This product is designed for use in both domestic and industrial applications. Fabric softening and conditioning properties compare favourably with proprietry branded products. This product is based on a diester quaternary ammonium compound, there is added preservative and dyes and perfume. The perfume leaves the washed clothes feeling and smelling fresh and clean. Directions: Handwashing add two capfuls to the final rinse. Wring and spin dry as usual. Twin tubs, add two capfuls to a bucket of water. Pour over clothes and allow to soak. Spin dry. Automatics, after full cycle pour on three capfuls diluted in a jug of water. Reset controls to final rinse. For a built in dispenser add three capfuls at the start of the final rinse. Do not pour undiluted onto clothes. Product available in 5 and 25 litre plastic containers. TC029. 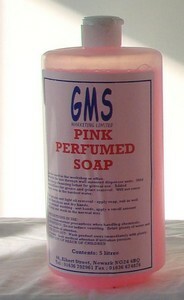 SDS077,78 Pink or Ivory Pearlised Soap. Description: This product is available with or without perfume is mild and has a rich cleansing lather. It can also be supplied without dye and added triclosan for a bactericidal soap product which will help prevent skin infections. Can be used in workshops or offices and is suitable for use through wall mounted dispenser units. Will not cause scum even in the hardest water. Description: Safe to use on stainless steel. Advanced formula dissolves organics as well as scale. Kills odour and bacteria at source and leaves a fresh apple smell. This product will also remove algae and slime from swimming pool surrounds and dissolves grease and scale from shower areas to leave all surfaces clean and safe. This is a concentrated toilet cleaner which kills germs and removes limescale and organic deposits and leaves toilets and sanitary ware clean and fresh. Directions: For regular cleaning apply evenly above the water line and around the rim leave for 15 minutes before flushing. For heavy soiling remove water from the bowl apply the product with a mop applicator and agitate. Flush the toilet and rinse out the applicator. 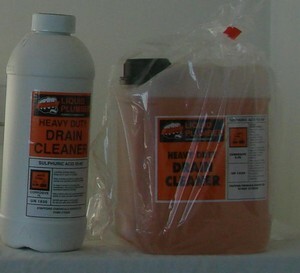 For hard surfaces dilute 1 part to 40 parts water and wash the surfaces and rinse. Do not mix with other chemicals. 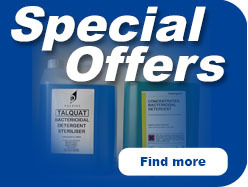 Available in 1 litre with directional flip top or 5 litre plastic containers.